Mark Ruffalo talks about #ATL100 at the Plaza Theatre. Mark Ruffalo is making the most out of his time in metro Atlanta, both on and off movie sets. While filming his roles as Bruce Banner and the Hulk for Avengers: Infinity War at Fayetteville’s Pinewood Studios (and on location in the Fairlie-Poplar Historic District) this summer, the Oscar-nominated actor, Bernie Sanders supporter, and longtime environmentalist has also been spotted hugging sea lions at the Georgia Aquarium, repping the Bravos, and clowning around with his costars Black Widow (Scarlett Johansson), Iron Man (Robert Downey, Jr.), and Doctor Strange (Benedict Cumberbatch). Yet Ruffalo’s latest outing focuses on a different group of superheroes in ATL: local community leaders working toward a clean-energy future in one of the nation’s most car-congested and energy-dependent cities. 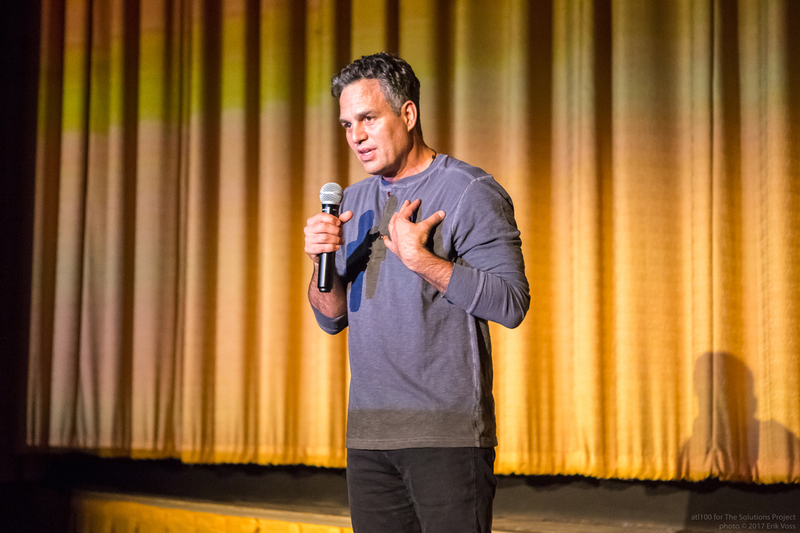 Last night in front of an intimate audience at the Plaza Theatre, Ruffalo launched #ATL100, a multi-week media campaign to bring awareness to the city’s recent commitment to achieving 100 percent renewable energy by 2035. At the two-hour event sponsored by the Solutions Project, a nonprofit Ruffalo cofounded to encourage business and community partnerships for the use of wind, water, and solar energy, the organization’s executive director Sarah Shanley Hope joined Stephanie Stuckey (Chief Resilience Officer to Atlanta Mayor Kasim Reed) and others to honor local activists Shan Arora, Dr. Yomi Noibi, Amelia Shenstone, Becky Rafter, and Dr. Joyce Dorsey. 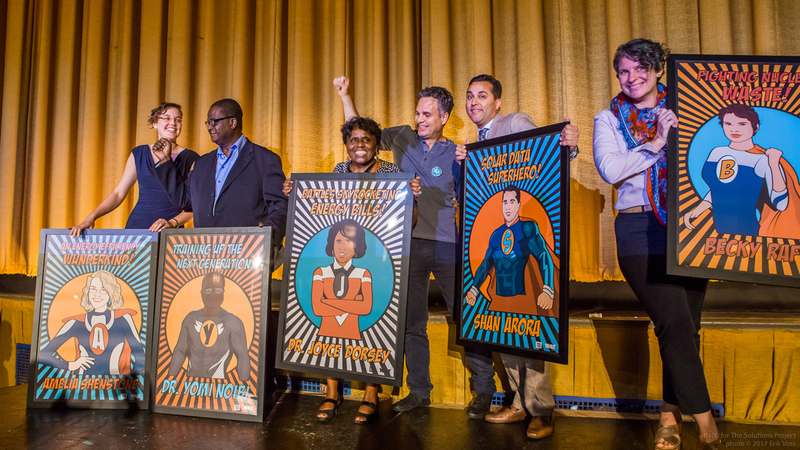 Ruffalo surprised the five Atlanta leaders with superhero posters featuring their own faces, and revealed an animated ad about the #ATL100 campaign that will screen this fall alongside previews in select Atlanta movie theaters. While the City of Atlanta’s benchmarks for #ATL100 are forthcoming as the project takes shape, these initial ads solicit donations, social media participation, and activism through grassroots groups such as Southern Alliance for Clean Energy and the Sierra Club. Ruffalo says he hopes #ATL100 will spark climate action and pay tribute to the legacy of Martin Luther King Jr.’s concept of the Beloved Community by emphasizing equity at all levels of energy distribution, consumption, and conservation. “This work is inspired by Dr. King’s words and teachings and actions,” Ruffalo says, backstage after the event. “I’ve always seen [environmental activism] as a continuation of the social justice movement. With the Solutions Project, we want to empower front-line communities to have freedom from energy dependence systems.” In most cities (and especially in Atlanta), that dependence might translate as a need to provide energy and transportation choices which do not marginalize populations who can’t afford gas-guzzling cars and yet have few clean-energy public options. That trap “can amount to a sort of environmental racism,” Ruffalo says. Although he stays busy portraying complex Broadway leads, rugged comic book icons, and loveable everyman characters, Ruffalo isn’t a fly-by-night celebrity do-gooder. He recently participated in the “March to Confront White Supremacy” after the tragedy in Charlottesville, and has been active in the anti-fracking movement, political campaigns, and environmental issues for decades. Amid recent natural disasters and the announcement that the U.S. would withdraw from the Paris Climate Accord, Ruffalo says other celebs—and additional cities—are coming out of the woodwork to join the cause. Atlanta is one of 27 cities that made the 100 percent renewable energy commitment earlier in 2017; now 150 cities are involved. The next step is taking the project from proclamations to actions.